Women were banned from acting in the kabuki theatre and so female roles were taken by male actors who specialized as female impersonators (onnagata). Ichimura Kakitsu IV was one of the most popular kabuki actors of the late nineteenth century. 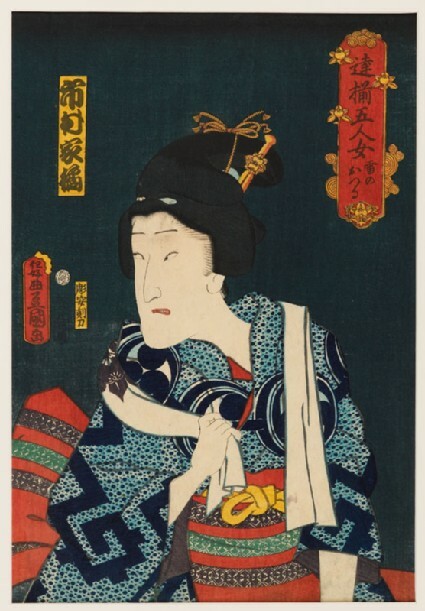 Here he is depicted as the fashionable heroine Otsuru, shown with a towel draped around her shoulders. It is interesting to note that the actor did not actually play this role in 1861, and that the artist has signed the print ‘Designed by Toyokuni, according to my own taste’ (Konomi ni makasete Toyokuni ga). Perhaps the artist (or his publisher) is fantasizing about a favourite actor in a favourite role here. Presented by Christ Church College, University of Oxford, 1983.